12 LARGE, organic Hass avocados direct from our family farm in Carpinteria, California. Hand-selected and harvested to order. Each avocado is 7-9 ounces. Certified USDA Organic. High Quality. Premium Avocados. Fresh with Superior Taste and Oil Content. Tree To Table freshness! Please note that Avocado Boxes are shipped Monday through Wednesday* via UPS. *Some shipment locations are pushed to the following Monday to prevent unwanted guacamole due to transit time and the weekend. Orders placed Sunday through Tuesday morning at 8:00 am PST are guaranteed to ship and be received by the end of that week. Yes, we charge for shipping due to avocados being a perishable product we have to ship in a timely manner to prevent unwanted guacamole. We do not upcharge/ overcharge for shipping. We are all hardworking and just want shipping ends to meet. Thank you for your avolove and support! 12 large organic Hass avocados handpicked to order on a family owned and operated ranch in Carpinteria, California. Each avocado is 7-9 ounces. 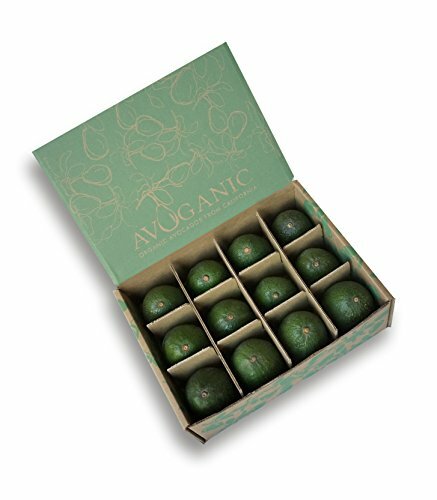 Also available in 6 pack organic California avocados, 5 lbs organic California avocados, 6 pack of 4 organic California avocados & 2 organic Meyer lemons, 2lb organic Meyer lemons, 5lb organic Meyer lemons. If you have any questions about this product by Avoganic, contact us by completing and submitting the form below. If you are looking for a specif part number, please include it with your message.